A site that is not overloaded with unnecessary content usually results to a smaller file size. Smaller files load faster compared to those with several complex codes. When a site loads slowly, viewers tend to leave the page and search for other sources. This then greatly affects your SEO marketing strategy. Always remember that user experience is a major factor to draw traffic to your site. If your visitors do not find your website user friendly, do not expect high conversion rates. Smaller files also take up lesser server space and do not clog your bandwidth and are lighter on your pocket. If you have several visitors, having a simpler website will be cost-efficient as this brings in the same traffic but at lesser cost. Building and designing a website with uncomplicated codes and elements is less taxing. If your site has a simple layout, typography and reasonable number of templates, this will require lesser time and effort to build. In addition, it will also be easier to find errors or bugs when something goes wrong. A complex site makes it difficult to find the culprit as you have to go looking into its different complexities. 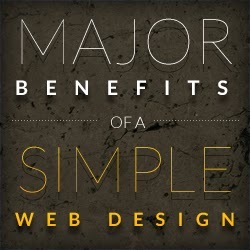 These are just a few of the major benefits of having a simple web design. Whether you are designing your own site or hiring a professional web design company, make sure that only necessary and substantial elements re included so that this will make things simpler. Remember that user experience is a very important factor to draw traffic, so make sure that your visitors get the best out of your website!